ChemGuru Online provides convenient online tuition in Singapore for A Level Chemistry at 50% of the cost of conventional tuition classes. 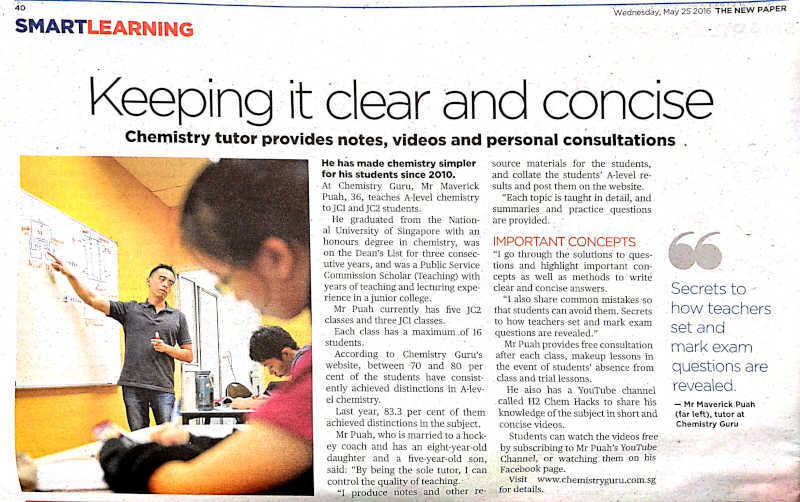 All lessons are conducted by top Chemistry tutor Maverick Puah who has personally taught JC Chemistry to hundreds of students since 2010. Learn H2 Chemistry at affordable rates, in the comfort of your home or at anywhere with internet access. If you prefer more structured weekly tuition classes, find out more about our JC1 Classes and JC2 Classes at Bishan Central personally conducted by Maverick. Maverick Puah is one of the most established A Level H2 Chemistry tuition teacher in Singapore with more than 10 years of teaching experience. His students have consistently shown improvement in their results by at least 3 grades, and countless students have achieved distinctions. Maverick makes his lessons simple to understand and shares many of his online lessons for free via his A Level Chemistry video lessons. His YouTube Channel is also immensely popular and has attracted 2000+ subscribers! View Maverick's full credentials and qualifications. Take a look at the results and testimonials and discover why hundreds of students find him such a good A Level Chemistry tuition teacher! Because our lessons are pre-recorded, there is no need to restrict learning to once a week or at the pace of the tutor. Learn any topic at any pace that you want. You can learn the entire H2 Chemistry Syllabus in detail, or go through a crash course and prepare for an upcoming block test. You can view our online lessons in the comfort of your home, your usual library mugging spot or anywhere with internet access. Our videos can be accessed using any electronic device: desktops, laptops, iPads or even your phone. This means no more precious time wasted on travelling for tuition. The lessons are available to you for 2 years, so you can rewatch the lessons as many times as you want, right up to your A Levels in JC2! Maverick Puah demands the highest quality in his lessons. All video lessons are recorded in high definition (HD 1080p) with crystal clear sound quality. You can download and print the summaries (pdf format) so that you can write notes as you view the lessons, just like in a conventional class. Have a concept to clarify or need consultation from Maverick? You can send your questions to him via Whatsapp and he'll get back to you as soon as possible. Parents can rest easy as ChemGuru Online tuition is around 50% of the cost of conventional class tuition. There is no minimum commitment or deposit payable. You can also view the free trial lesson for each topic before deciding if you want to purchase the lesson package. Payment is made securely via PayPal or using your credit card if you do not have a PayPal account. If you prefer weekly conventional tuition classes, find out more about our JC1 Classes and JC2 Classes at Bishan Central. Please click on the following topics to view the free trial lessons (~30 minutes). We are adding the following topics next, so do check back at our website soon if you are interested! Organic Chemistry is a HUGE part of A Level Chemistry Syllabus that schools often spend MONTHS to teach. Attending conventional tuition lessons for Organic Chemistry will take several months which will cost more than $2000. Now you can purchase ALL Organic Chemistry courses as a bundle instantly at HALF the price! You get 32 hours of high quality online lessons with unlimited rewatching for 2 years. Original price to purchase all Organic Chemistry courses independently is S$1414, but you can buy them as a bundle at S$1132 only (20% OFF)! Grab this offer now! Attending conventional tuition lessons for these topics will take several months which will cost more than $2000. Now you can purchase ALL these foundation courses as a bundle instantly at HALF the price! You get 30 hours of high quality online lessons with unlimited rewatching for 2 years. Original price to purchase all JC1 Core Ideas Foundation courses independently is S$1357, but you can buy them as a bundle at S$1086 only (20% OFF)! The future of education is right at your fingertips today. Check out the class timing, topics covered and fees for our JC1 Classes and JC2 Classes at Bishan Central.